All Of You Should Love All Of Mee! Interview with Gavin Mee by Anthony Sullivan for the Tullamore Tribune. SOMETIMES its your instincts that lead you to really discovering an artist. You see their names popping up time and again in magazines, for instance, or you hear them mentioned by people who’s tastes in music you’d know well enough to trust, so you decide to check things out for yourself. But there are times, however, when you can discover an artist completely by chance. That’s what happened with Gavin Mee, a singer/songwriter from Dublin. I was in work in TRAX one Sunday just a few weeks back and a gentleman walks in and enquires if I’d ever heard of a chap called Gavin Mee and if we might have his latest album? The name was a new one but I figured if this gentleman was interested in him, then quite possibly more people would be also. I asked this gentleman where he’d heard Gavin and his answer confirmed my hunch that I should follow this up! On Niall Toner’s radio show on RTE Radio 1 was his reply. Now, for those of you who may not know Niall, he’s one of Ireland’s foremost blue grass musicians and songwriters. Not only that, however, he’s a music lover through and through and a man who knows and appreciates genuine talent. So if Gavin Mee had already got the thumbs up from Niall, that was pretty much all the research I needed to do in terms of quality. A quick text to Niall and before long I was in touch with Gavin himself and enjoying the trip through the tracks of his brand new album ‘MeeMantras’. After a bit of juggling around with both of our diaries, I finally had the pleasure of sitting down for a bit of a chat with Gavin last week.I began by asking him if ‘MeeMantras’ turned out to be that oft’ referred to ‘difficult second album’ that afflicts so many artists, and was it always the plan to leave as much time between his debut album ‘Breech Birth’ (2006) and this, or had things simply turned out that way? When Gavin speaks about investing so much time in each song, trust me folks he really means it! There’s barely a second on ‘MeeMantras’ that isn’t like wandering through some magical land of sonic wonder, theres so much happening at once. Now no artist likes to be pigeon holed per say, but comparisons help people get an idea of who an artist is. Trying to compare Gavin to anyone, though, is one hell of a test. Which is probably a pretty cool thing in its own way. But how does Gavin himself describe his music to people, I wondered? Gavin’s record label is called ‘Birthings Records’. His debut album was called ‘Breech Birth’. And track 1 on ‘MeeMantras’ is entitled ‘Push The Boy’. My inner Sherlock Holmes sensed a definite theme here, and set off in search for answers! Gavin mentioned earlier that he lost his voice for a couple of years at one stage, what happened? “I suppose it was a combination of never having been trained vocally and you’re singing a lot and probably smoking and drinking and doing all those kind of things. You don’t know the fundamentals (of looking after your voice), Anthony. I kind of forgot where to breathe from and lost the connection to what I was singing. So a lot of training I did was to find that core of where to breathe from again. Its something I had to relearn, but not just relearn also digest again. When you’re learning again you’re very aware that you already have all these songs that you sing in a certain way. So you’re confidence has gone and you don’t know if you can sing them again. That was scary. Because when that happens, you think maybe I’ll have to do something else. I don’t think I’ll be able to do this…..And its very hard to find someone who can help. Like, Fiona McAndrew, this particular teacher that I had, she was great. We met through a mutual friend and it was incredible to meet her because when we started talking she told me that guys in their mid 30’s can sometimes run into this kind of wall. And she was interested in working with me, it wasn’t like she was taking on a whole lot of people, ya know. She just found that I was a specific case, maybe a mental case! But it is kind of like finding a therapist, you can’t just google these people. I sang ‘Don Giovanni’ for a year, but I can’t remember a line now! But as I said what was really important was not just to learn, but to digest, so that you’re not even thinking about your breathing anymore. And I don’t even think about it anymore. You do, though when you have no confidence. Its like learning to ride a bike again, you’re conscious of trying to keep your balance. But Fiona got me past that and through it. And it was incredible to have her support. And it just happened to be between albums. It was just the time it was and the way it was, but I overcame it. 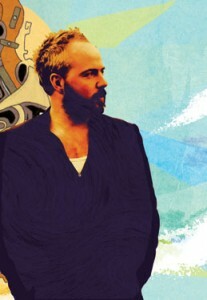 *Gavin’s new album ‘MeeMantras’ is available now in TRAX, the Bridge Centre Tullamore, Tower Records Dublin and through www.gavinmee.com. Also available to download on iTunes. This entry was posted in News & Stuff. Bookmark the permalink.